2015!! I really like the way those numbers sound - "twenty fifteen". Don't you just love the beginning of a brand new shiny year, full of possibilities, plans and dreams. Let's celebrate Blue Mountain Daisy style with a fun New Year flower arrangement. 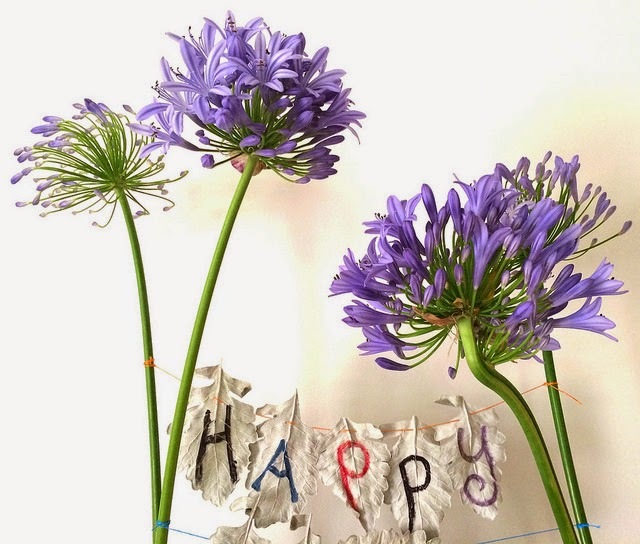 There are a few things make me link agapanthus flowers to the New Year. The obvious being that here in Australia at the height of summer they are blooming everywhere!! Those showy flowers that come in blue and white are a feature in every second garden in my neighbourhood. The second reason is their racemes of pretty star shaped florets look the explosive sparks of fireworks. And if you stretch your imagination a little more they could be the effervescence from the bubbles of champagne. So to welcome the New Year I began my January arrangement with a handful of agapanthus, picked early this morning. 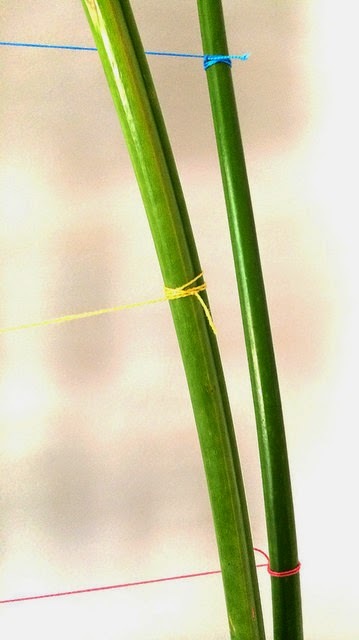 ... and then I added some leafy bunting to hang in between the elegant stems. 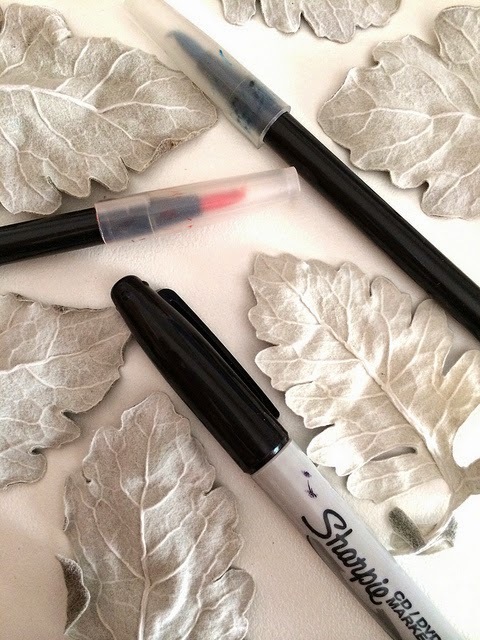 For the bunting leaves I used Sineraria Dusty Miller and then simply wrote on the backs of the leaves with markers. The champagne bottles are from our Christmas and New Years celebrations, it only seems right they get to play a role in this flower party. ...wishing everyone all the very best for a wonderful and Happy 2015. 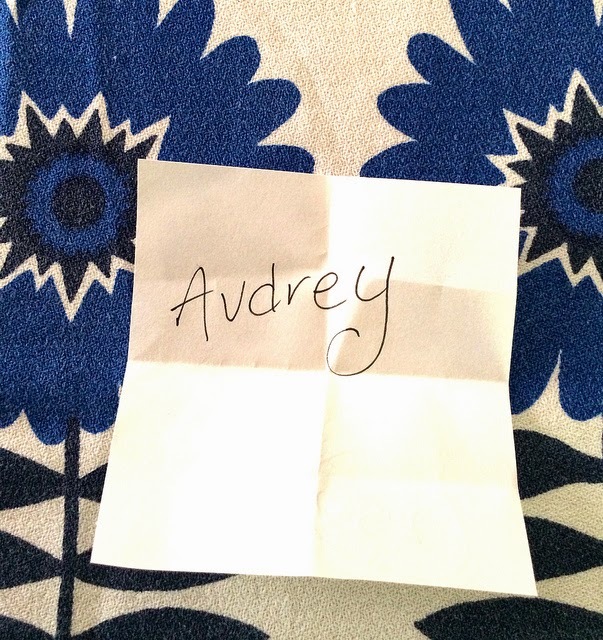 Ps The giveaway winner from the previous post is Audrey of Quilty Folk. Thank you to everyone who helped spread smiles with your wonderful comments. Happy New Year to you too. I love your celebratory Aggies and bunting. Let's hope we get to feel a little breeze here. The aggies around here are looking lovely this year. Definitely a sign of summer. very creative arrangement! light breezy and happy! wishing you a wonderful year sweet friend! I suspect you spread smiles wherever you go Rachael! There are always smiles when I visit the Blue Mountains! Happy New Year and enjoy some time to your self in the next few days! I love how you created that! I agree 2015 sounds good and wishing you a very happy new year! Happy New Year to you too. Those agapanthus are totally fireworks (oh lord i sound like Valley Girl). We went to the early ones with kids and flowers exploded all over the sky. What a great Ancient Chinese invention! Have a very happy, healthy, and blessed beyond measure, twenty fifteen Rachael and DH ! I love it when you talk flowers, Mrs. Daisy! You are so cute & clever. Happiest New Year to you & yours! Lovely arrangement! 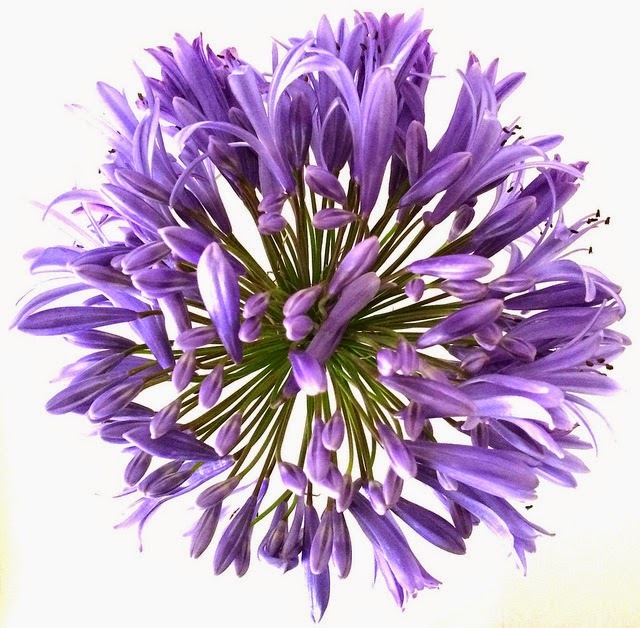 I love agapanthus, we grew a lot of it in California. Oh, but for a warm New Years breeze this year...it is sub zero here! Have a wonderful 2015 and congrats to Audry. Happy New Year Rachael! Yes, I do love the sound of 2015! I love the silvery foliage of Dusty Miller and those bursts of agapanthus! They both reminded me of my life in California! What a beautiful mix for the arrangement. And, just felt that breeze!!! 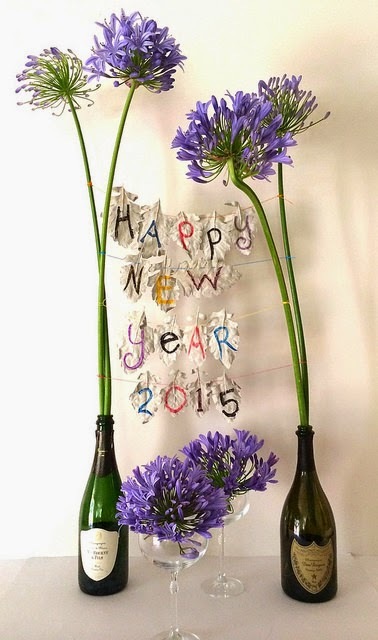 Happy New Year, such a creative use of agapanthus and leaves too. You are so creative! I love your little banner and thanks for sharing a bit of summer with those of us who are freezing at the moment! Lovely photos and I loved the leafy bunting. 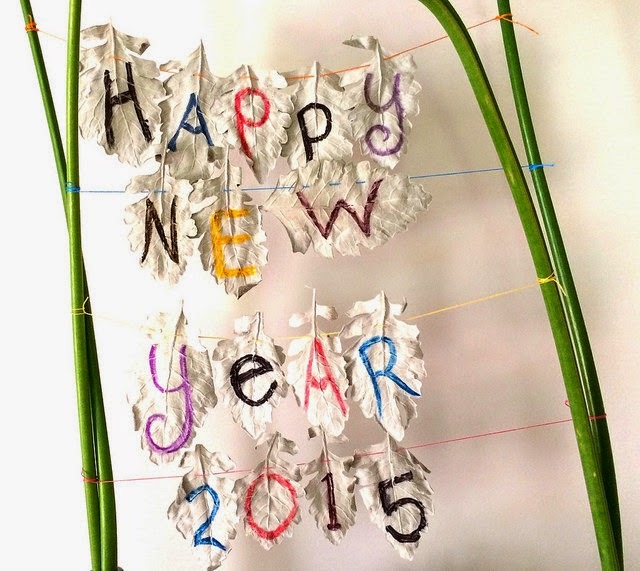 Here's to a happy and creative 2015. Your New Year greeting is beautiful bright and floral! May it be an extra special one for you both Rachel. A very Happy New Year to you as well. I will have to wait months for my Agapanthus to make an appearance so I will just enjoy your lovely photos! What a beautiful arrangement. Happy New Year to you from cold and snowy Colorado. Your beautiful floral arrangement certainly added some warmth and color to the my snowscape. What a lovely display to wish in the New Year. May the best of 2015 cross you path this year. What a creative flower arrangement! I hope that you and your family have a happy and healthy 2015. Happy New Year! Those purple flowers are beautiful and I love the fun arrangement. Happy new year Rachael-aggie! I love Aggies too. Wish you lots of love, creativity and fun, and, of course, lots of laughs this year. Happy New Year to you Rachel too. 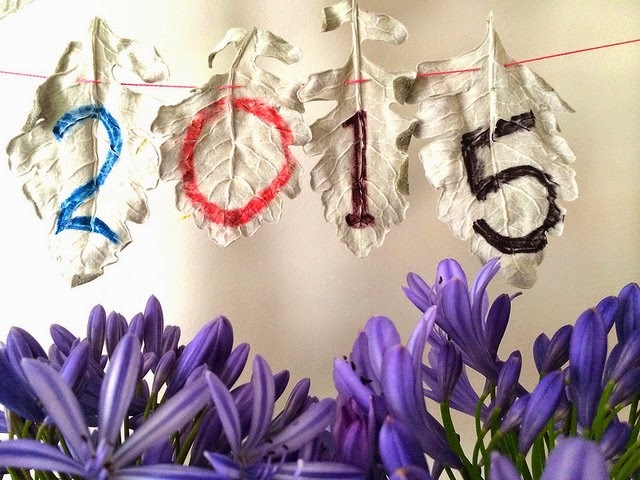 Hope 2015 is a happy, healthy productive year for you. I've loved following your creativeness this last year, and look forward to seeing what you do in the year coming up. What a lovely imaginative idea to have the bunting and the agapanthas. And I love them in the champagne bottles. This is a beautiful and fun way to welcome in the New Year. Love it! And Happy New Year wishes to you. Happy New Year Rachael! I can't wait to see what this new year brings! Happy New Year!! 2015 is sure to be filled with color and imagination. I'm glad I can find a fix of both here with you! Love those flowers with the leaves! Very sweet arrangement. :) Happy New Year to you too! Love that I won the magazine with your article in it too! I think you have the most creative eye! I think the flowers definitely inspire your quilts and vice a versa! Happy New Year! Thanks for the cheery flower arrangement - love it. Your creativity never ceases to amaze me!! What a pretty flower arraignment! Happy New Year to you too! 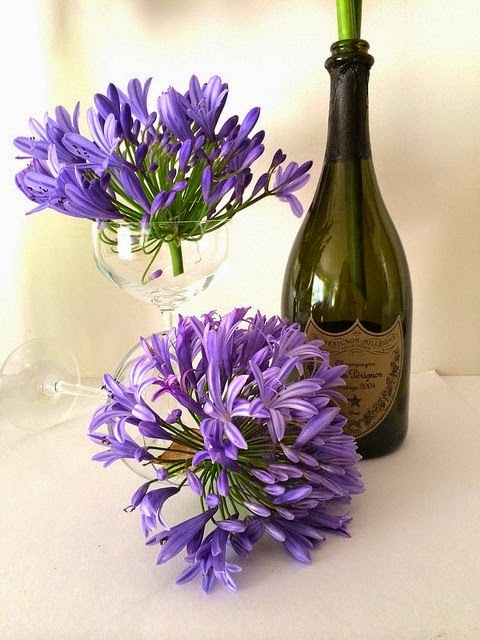 lovely purple/blue bursting flowers and fancy bubbly for the new Year! I love your creative display. I was just watching the California rose Bowl parade where all the floats are made of flowers and organic materials. Do you know of it? you'd love it. You can google image it to see them. Happy Happy New Year Friend! 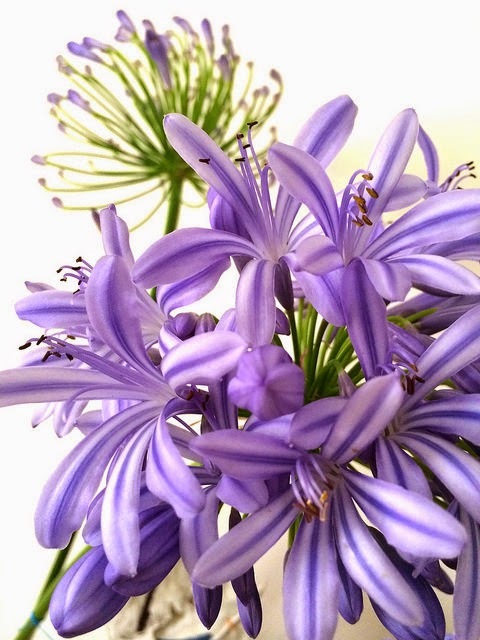 Hi Rachael, I love agapanthus. They are so cheery and quite beautiful when planted together in large numbers. Happy new year! Oh yes I felt that breeze Rachael....what a lovely post! You are so creative! Congratulations to Audrey on her win....and a very Happy Twenty fifteen to you!!! You are always so clever in creativity :) We do not have your purple flowers here :( . They are beautiful. Looking forward to sewing in 2015. I LOVE your sweet arrangement! And we had much more than a breeze here yesterday -- a bitter cold wind that tore through us -- I like to think your gentle wishes just picked up a lot of steam by the time they got here LOL!!! Your posts are as fun and creative as you are, happy new year! Great New Years arrangement. I have two white agapanthus in pots. I didn't get to enjoy them for long as they only just flowered before we went on holidays and now we are back they are ready for removing. Wish I had a blue one but they are hearty things. My Mum had miniature ones.